สวัสดีค่ะ (sà wàt dee khâ) Hello and welcome to Mizpah Silk. Silk. The Queen of Textiles. Supremely beautiful and luxurious, it speaks of impeccable taste, elegance and style. The Silk Road chronicles the quest for this most regal fabric and Thai silk is considered by many to be the most beautiful of all silks. Mizpah Silk is dedicated to producing the finest Thai silk. Our silk is 100% pure Thai silk, processed completely by hand from cocoon to loom. We work at the village level in Thailand, directly with the women who produce and process the silk. This allows us to create products in a manner that is ethical, socially responsible, healthy and environmentally responsible. Mizpah Silk does not stock ready-made silk fabrics. Each and every piece of silk ordered is made by hand by a highly skilled weaver in Thailand specifically to fulfil that order. Our weavers are extraordinarily talented women who pride themselves on producing only the best fabric. They particularly enjoy knowing that what they make is destined for one particular person. This highly personal approach makes the women who weave for Mizpah Silk unique. It also makes our products unique and highly sought-after. Mizpah Silk makes products from the finest 100% pure Thai silk. 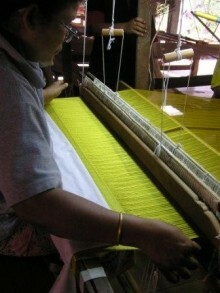 All products are woven by hand on traditional handlooms. We offer lengths of silk fabric, made to order. With such a rich palette of colours and designs, there are many possible options for you to choose. Please feel free to contact us to discuss your requirements with us. We look forward to journeying along the Silk Road with you. ขอบคุณค่ะ (khààwp khoon khâ) Thank you for choosing Mizpah Silk.